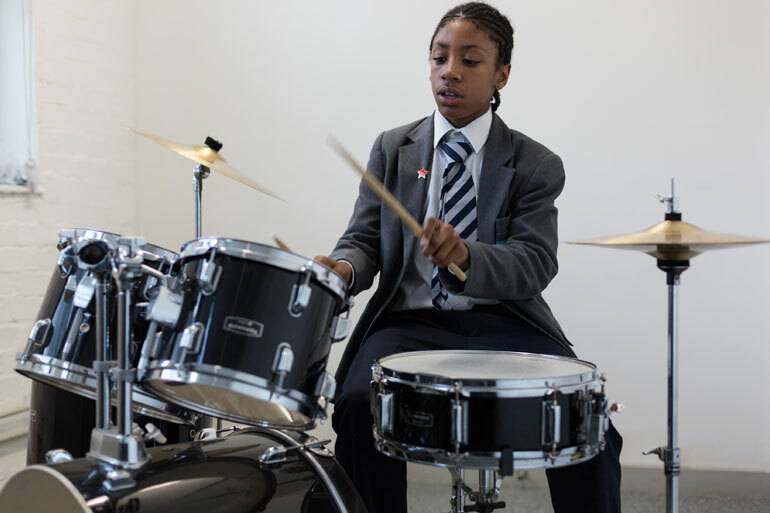 Music and musical education are at the heart of Hackney New School. The founders of Hackney New School wanted to ensure that all pupils have access to musical education and its many benefits from their very first day at the school. Playing and performing music has a deep impact on our students’ lives, from developing their focus and concentration to their understanding of the merits of hard work and practice. 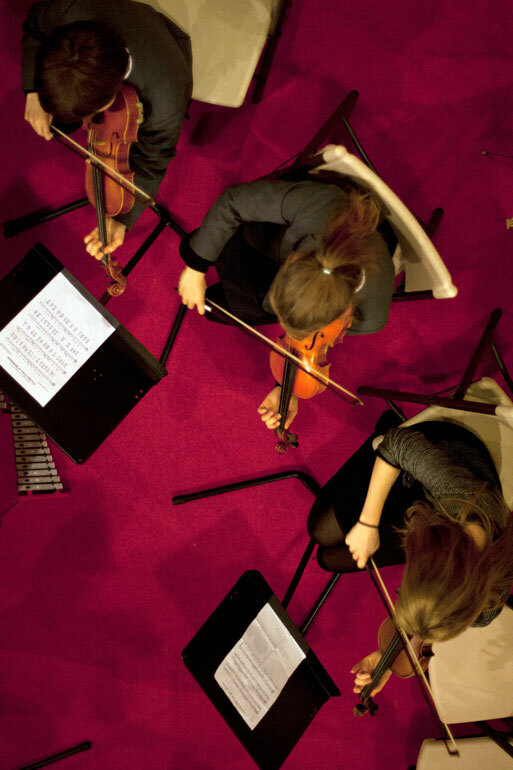 Our music education rewards both individual effort and team work and has been a cornerstone in building the uniquely supportive community of Hackney New School. 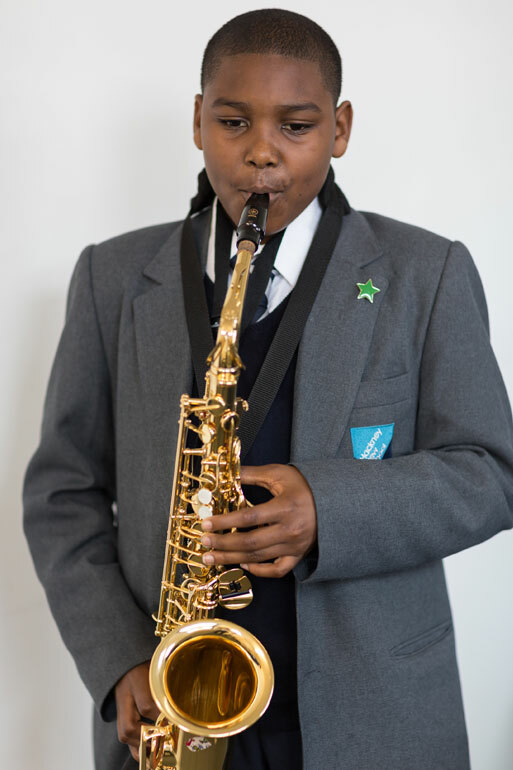 Every student has the opportunity to learn an instrument, free-of-charge, at Hackney New School. Our instrumental staff are professional musicians, many of whom work for Hackney Music Service and in the wider community. We offer small group and individual instrumental lessons on flute, clarinet, saxophone, violin, cello, double bass, trumpet, French horn, trombone, piano, drum kit, guitar and voice. We offer two Key Stage 3 music curriculum lessons every week and an inspiring range of daily lunchtime music clubs, from songwriting and music technology to Brazilian samba. All students participate regularly in large-scale school concerts, as well as having the opportunity to perform in fortnightly whole year choir rehearsals. We plan that every student at HNS will take a Key Stage 4 qualification in music. We will also offer music qualifications at Key Stage 5. Enrichment musical activities include Chamber Choir (entry by audition), Key Stage 3 orchestra and scholars’ orchestra (for music scholars and those who have passed higher graded practical music examinations). Music is also integrated into other subjects too – singing songs in French and Spanish, writing lyrics in PSHE, and thinking about division in Maths using note durations are some examples. We invite professional musicians into school to give performances and workshops, in order to broaden and deepen students’ musical understanding and experiences – previous workshops and projects have included HMDT Music’s Hackney Chronicles, an opera by Jonathan Dove in which all Year 7 students performed, ‘Voice Jam’ with Chamber Choir and a local recording studio, a session with the harpist Ivana Selebran, and Grand Union Orchestra. Chamber Choir also recorded vocals and a video with the musician and producer Todd Speakman for his track ‘In Flight’ which has had airplay on XFM and BBC 6Music. Past projects include ‘Take Note Creative Ensembles’ project in collaboration with Hackney Music Service and LSO, and a workshop by the virtuoso gypsy violinist/guitarist Tcha Limberger. We also enter a number of our music groups for the annual national Music for Youth Festival, as well as performing in local events such as the Hackney Music Service gala at the Hackney Empire, the Hackney Half Marathon and ‘De Beauvoir Remembers’, a WW1 commemoration event at St. Peter’s De Beauvoir. We have a record label on NUMU, to which students can upload their own music. All students in years 7 and 8 work towards the Bronze and Silver Arts Award respectively. These awards are embedded into the music curriculum, and are supported by other departments such as Art and English. A number of our students are also in other musical activities such as Hackney Borough Youth Choir, Hackney Borough Youth Orchestra and London Symphony Orchestra St. Luke’s Youth Choir, and we strongly encourage this.